This is a software program that has the potential to not only make your emailing lists cleaner with regard to the authenticity of the email addresses they contain but also help you improve your conversion rates. Its design is extremely simplistic which means that you do not have to be a technological whiz to use it. There are many benefits of removing redundant or invalid email addresses from your mailing list. For example, if your emailing list is devoid of redundant email addresses then you would be better able to track the effectiveness of your bulk emailing campaign. Resultantly, your conversion rates would improve and the chances of you email getting blacklisted by ISPs will reduce. We designed our Email Verifier Lite for one reason and one reason alone i.e. to help mass email marketers improve the quality of their mailing lists without paying too much or using too much processing memory for it. In essence, this email verifier software program is a lighter version of our award winning and much appreciated email verification software known as Email Verifier. Thus, if you are interested in a more advanced email verification software program then click here. There are two principles on which our email verifier software program is based on. The core principle is that of automation. This software program can remove around 80 percent of redundant email addresses in your emailing lists and all you would have to do is press a button and ensure that the software program has SMTP access. Most email verification software programs in the industry are heavy duty and require a considerable amount of storage space and processing speed. The verification software programs in the industry that are not light, on the other hand, tend to not have enough functionality and quality about them. Our software program is a lighter version of our industry leading email verification software program. We have carefully worked on our bigger software program so as to make it smaller without actually affecting its potency. Resultantly, the Email Verifier Lite is effective and efficient. Our Email Verifier Lite takes after its big brother, the Email Verifier, when it comes to efficiency in validating email addresses in emailing lists. It can validate up to 50, 000 email addresses in one hour, which is a considerable feat considering the fact that it can remove up to 80 percent of the redundant email addresses in your emailing lists. As its name suggests, the Email Verifier Lite is an extremely simplistic software program that just focuses on its core purpose. However, the qualities of this software program do not come at any price because it is a software program that does not require a lot of computing power or storage space to work. Many email verification programs in the industry are limited in terms of the size of emailing lists that they can handle. 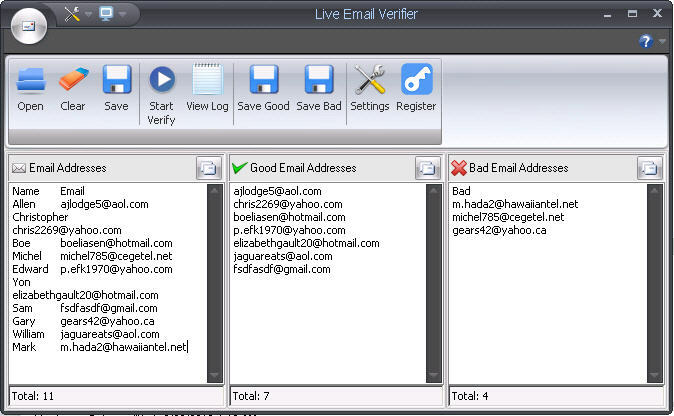 However, our Email Verifier Lite can handle, at the very least, 1, 000, 000 email addresses at one go. Therefore, with this program you do not have to waste time splitting big emailing lists into smaller lists to be verified. As this software program is a lighter version of its bigger variant, it has all the compatibility benefit that the bigger version has. This program would allow you to import and export your emailing lists from and to third party software programs such as simple text files, MS Word, MS Excel, MS Access, HTML, Dbase, and even Foxpro. If it is indeed efficiency that you are looking for in your email verification software program then you would not be disappointed with our Email Verifier Lite as it is intrinsically designed to be efficient. This is our promise to you. Get it now!